I had never heard of RiRe until I was shopping online on Althea. I am usually a bit wary of buying cosmetics from brands I’m not familiar with because I’m afraid of allergy reactions and disappointing results, but I decided to try this after my relatively ok experience with the brand’s All Kill Blackhead Removal Stick. 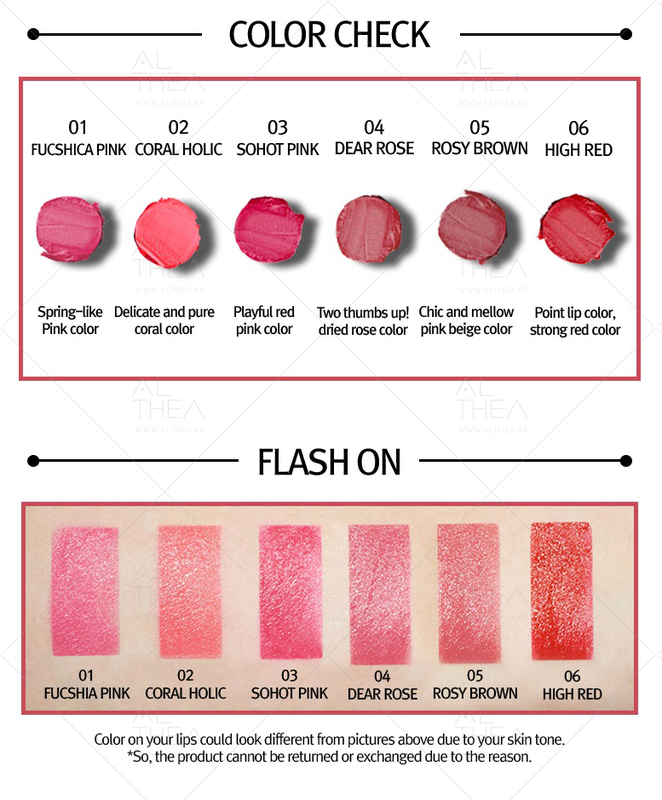 Long lasting lipstick color creates a delicate shimmer. The soft texture creates a uniform coverage and improves lip luster and volume. I always have a hard time choosing lipstick colours, so I usually refer to model photos in the product description. I thought this was a very sweet colour that can brighten up my skin complexion, so I went ahead to buy 01 Fucshia Pink. The product I received was… quite different from the product shots I saw on Althea. The packaging is not very luxurious, and the colour of the lipstick looked a lot more purple than I had expected. I’m quite pleased with the colour payoff this lipstick gives. It took just one swipe for the swatch above, and that shows how intense it is. Don’t be fooled by the shimmer of the colour though – it’s not exactly hydrating. I do admit that this lipstick is quite long-lasting, capable of staying on your lips for a decent few hours. HOWEVER – I’m not sure if it’s just my personal sensitivities or some other contributing factor, but I experienced a slight swelling in my upper lip on not just 1, but 2 occasions that I used this. It happens when I’m in contact with too much dust, so I’m not too sure if that’s the reason behind it, or if there’s something in this lipstick that’s irritating my skin. To be frank, I haven’t used this lipstick for quite a while because I’m afraid that I’ll get the same reaction as I had before, and I’m not keen on going out with swollen lips. I don’t think it has actually happened to other customers yet, so maybe it’s just me. Nonetheless, if you have sensitive skin/prone to allergy reactions, you might want to give this a miss. I think it’s a pity about the skin irritation/allergy thing because I actually like the formula – it lasts long enough, and the colour is pretty good. Maybe I will try it again and cross my fingers in hopes that the next time will be fine.